Twas a very quiet day yesterday and we didn't leave the house. I was up for going to another park, but Lu felt most things would be closed. Sao Paulo itself always seems very quiet because so many people leave the city for holidays. Not sure what we did in the morning, but I know I played a fair bit of Deus Ex: Human Revolution. OK, it's not outstanding, but it's fun to play (Dead Island's discounted today in the Steam Sale, but I can't buy it because Steam won't accept payments from countries that don't match the address of the account holder. Fume! Plus I can't get on my home PC to buy it as now the Internet connection has failed completely. I suspect Virgin's not-so-SuperHub has fallen over and needs rebooting). I suspect the playing of Deus Ex continued into most of the afternoon as well. I'm trying to take advantage of maximum Nana-babysitting time. 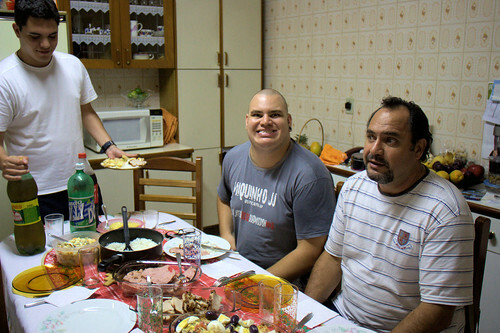 Lu's Uncle Reginaldo, Aunt Gisele, and cousins Bruno and Denis came over late afternoon. They're on their way to Buzios so had asked the MIL if (a) they could "pit stop" here overnight and (b) see in the New Year with us. I have to say they are a wonderful family; both charming and funny. Denis is a bit of a tech fan, and was showing me his GoPro camera (a couple of shots are up on Facebook) which he also uses for motorbiking. I then continued to play Deus Ex for most of the evening on and off, interrupted by a call to my parents at midnight UK time (no-one picked up the phone so I left a voicemail). A few minutes before midnight we all joined up, and then at the stroke of midnight said our "Feliz Ano Novos" and had champagne. The sky was alive with fireworks - the amount of fireworks let off at midnight here in the city is quite something to behold, and I've never seen anything like it elsewhere. Unfortunately the noise woke up Amélie, but she really enjoyed watching the fireworks. It was then somewhat difficult to get her back to sleep, not helped by an unbelievably inconsiderate neighbour that often plays loud music at night (and was playing it louder and longer last night. Part of the problem here is that some people are particularly stupid). Fortunately my earplugs are amazing, and I could hear almost nothing. Lu has an incredible gift to sleep through the loudest noise, and once Amélie's asleep she's more or less the same. Amélie was up at 6am this morning, so suffice to say we're all a bit tired. 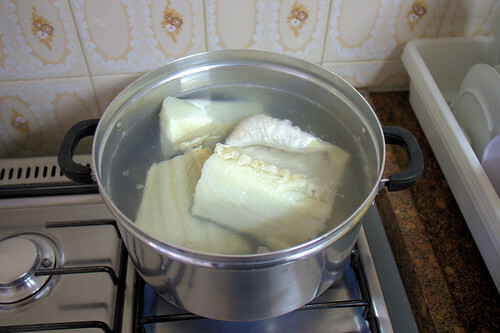 ^Preparing the bacalhau (dried salted cod from Portugal) for yesterday's dinner. 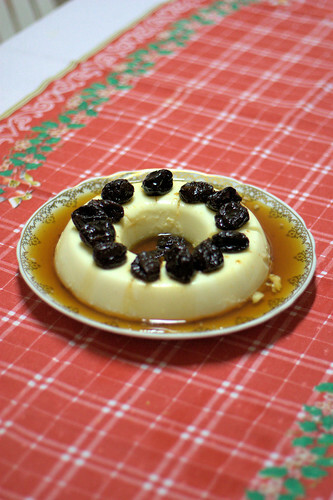 ^Manjar. Not sure where this comes from, but wow does it taste good. All 20 photos are here at Flickr. Does Denis look like Gomer Pyle all the time, or just in that photo lol? More so in that photo. He suddenly grew over the last few years, to the point where I almost didn't recognise him after not seeing him for a year.